Major project for self bag drop at Denver International Airport has started with Materna: In the area of self bag drop, Denver International Airport (DEN) is becoming a real pioneer in the USA. As part of the ongoing renovation of DEN, the redesigned airline ticket counters in the Great Hall will be equipped with the world’s largest installation of self-service equipment. DEN and the company Great Hall Builders, which was founded for the purpose of the renovation, have selected the solution from self-service specialist Materna US. Materna’s self-bag-drop solution gives the airport the highest level of flexibility and security in passenger handling, helping to handle the tremendous growth in passenger traffic. 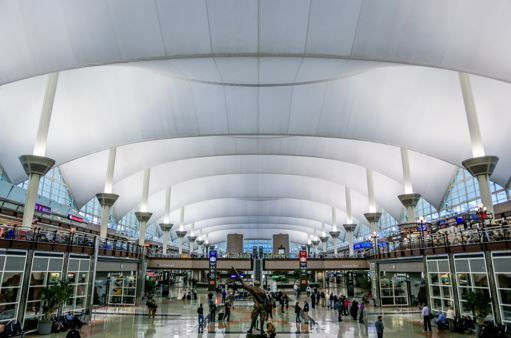 The implementation of the Materna self bag drop systems is part of the $650 million Denver International Airport’s (DEN) Great Hall project that is now underway. As part of the planned redevelopment of DEN’s Jeppesen Terminal, Materna has been commissioned to equip the world’s second largest airport by land area with extensive self-service equipment by 2020. This will include 176 hybrid self bag drop units and 40 check-in kiosks. It will be the world’s largest self-bag-drop installation and the first major U.S. airport to fully embrace the many benefits of these services. In North America, the topic of self bag drop is still being discovered. DEN is currently increasing its capacity significantly and investing in technology to help serve approximately 80 million passengers per year in future. Originally, the airport was designed to handle 50 million passengers. The planned expansion also focuses on improving airport security and further improving the passenger journey and experience. Materna’s self-bag-drop solution comprises a classic agent counter combined with a self-bag-drop unit and scanner portal positioned over the conveyor to scan baggage tags, as well as numerous other features. The scanner unit also ensures safe baggage handling processes by only accepting baggage of the correct size and weight. The hybrid solution is easy to customize and integrate. It gives the airport and its passengers the highest level of flexibility in passenger handling, as it allows both self-service and personal service at the counter. The kiosks are equipped with Materna’s well-proven common use (CUSS) platform that all airlines can use. Some major airlines are already undergoing integration. The Materna self bag drop solution helps to create a more efficient and comfortable passenger experience and fits perfectly to the project needs of Denver airport. This flagship project in the USA is an important milestone for Materna’s activities worldwide and particularly in North America. Materna has already successfully completed proof of concepts and full installations at numerous airports in the Americas – e.g. Toronto, John Wayne Airport, Montreal, Miami, Quebec & Minneapolis-Saint Paul International Airport. The Denver International Airport (DEN) certainly marks an enormous step forward for self-service in the aviation industry in the U.S. The Great Hall check-in terminal, which is under the tents of the airport’s Jeppesen Terminal with its striking design, is DEN’s distinctive trademark. The Great Hall Project officially kicked off on July 12, 2018. The goal is to keep up with the constant growth of DEN, and thereby increase capacity, airport safety and security, and improve the passenger experience. The project will be completed in 2021.